When it comes to movies, one sports translates to the silver screen better than any other – baseball. For decades, theatres from coast to coast have hosted their fair share of great movies set on the diamond, films that have become a part of American pop culture. And in the process, they’ve created some of the most memorable characters in cinema history, people that audiences could identify with, root for and even empathize. 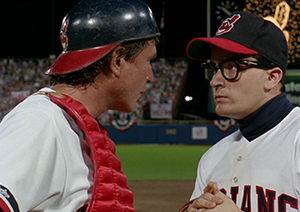 Baseball movies have also created a legion of fictional players that would be perfect additions to any real-life team. They’re the kind of athletes that fans of downtrodden teams would love to see added to the roster; they’d be the difference makers that would turn a losing franchise into a winning one. At this point, that type of whimsical notion is among the most-realistic hopes for Rockies fans; after all, the franchise isn’t exactly vying for the top talent available every year during the offseason. A star has about as much chance to walk out of a cornfield and onto the grass at Coors Field as the team does of signing a big-name free agent. And it wouldn’t take many to turn things around. A few key additions, plucked straight off the big screen, could make Colorado a baseball hotbed once again. Morris Buttermaker (The Bad News Bears) – As tempting as it would be to tab Lou Brown (Major League) as the manager, it seems more appropriate to replace Walter Weiss with Walter Matthau’s lovable curmudgeon. Nobody was better at getting a group of ragtag ballplayers to work together; heck, he was even able to corral the perpetually troubled Kelly Leak off his motorcycle and into the outfield. Plus, he’d have lively postgame pressers; there’d be no clichés from this beer-swilling skipper. Billy Chapel (For the Love of the Game) – Pitch counts be damned, this wily veteran would take the hill inning after inning, trying to will his team to victory despite an aching elbow. That type of mentality would go a long way on a staff that seems to be searching for their latest hangnail, perhaps even rubbing off of the younger generation of pitchers who are used to being coddled. Roy Hobbs (The Natural) – A star player in his prime isn’t going to come to Colorado; at least not within the Rockies budget. But a guy with a past, who saw his once-promising career derailed by some poor choices, just might. Hobbs would flirt with .400 and belt 45 home runs at Coors Field. While he might not hit one into the light supports atop the stadium, there’s a 50/50 chance that he could belt a dinger onto the party deck; that’s got free margaritas written all over it! “Nuke” LaLoosh (Bull Durham) – Every great team needs a wide-eyed rookie who doesn’t know the gravity of the situation; he’s the guy who takes the mound in a pivotal game and isn’t rattled because he has no idea that it’s perhaps a once-in-a-career opportunity. This young fire baller would fit that role. 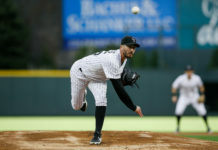 Plus, he’d also have no idea that pitchers are supposed to struggle at Coors Field; thus, he’d take the mound and do what ever other pitcher ought to do – chuck it. 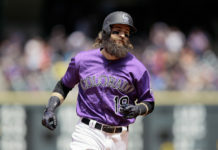 Jake Taylor (Major League) – The aging veteran with one last shot in the big leagues certainly wouldn’t allow his teammates to check out at midseason. He showed up at Roger Dorn’s house and threatened the prima donna third baseman with physical harm if he didn’t start giving maximum effort all of the time; so he’d have no problem giving Troy Tulowitzki an ultimatum if the $20 million shortstop couldn’t make it to first base without pulling another leg muscle. 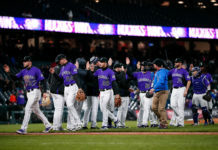 Ricky Vaughn (Major League) – Game after game, the Rockies seemed to have seen wins turn into losses during the late innings, as their bullpen has been a dumpster fire. Blown saves would be a thing of the past with “The Wild Thing” coming in to close the door in the ninth; that’d lead to 10 to 15 more wins per season, which would put Colorado right in the thick of the wild card race. With this cast of characters, it’s not hard to imagine the latest version of the play-in game. The script practically writes itself. Buttermaker decides to go with LaLoosh, even though Chapel is rested and ready. In the eighth inning, however, he has to call on his veteran righty to get the youngster out of a jam. Taylor greets Chapel at the mound, gives him a little pep talk, and the side is soon retired. Then in the bottom of the inning, Hobbs hits his league-leading 50th home run to put the Rockies on top, setting the stage for Vaughn to close the door in the top of the ninth. Buttermaker opens his cooler for the postgame celebration… Cut to credits. Too bad that’s a story that could only be penned in Hollywood.